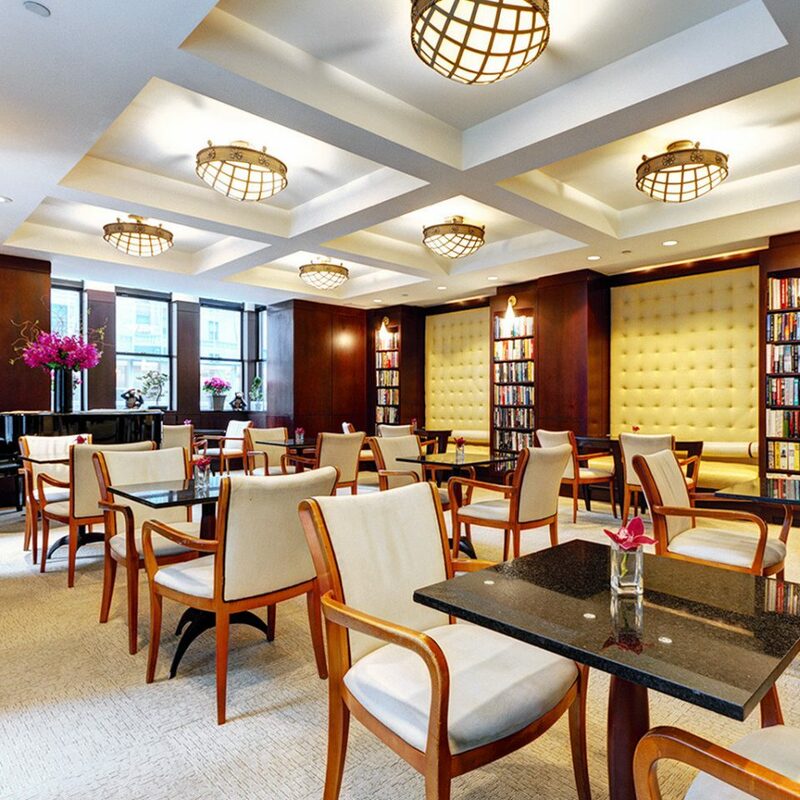 Being in the Library Hotel is like stepping away from a crowded dinner party and into a well-kept study. 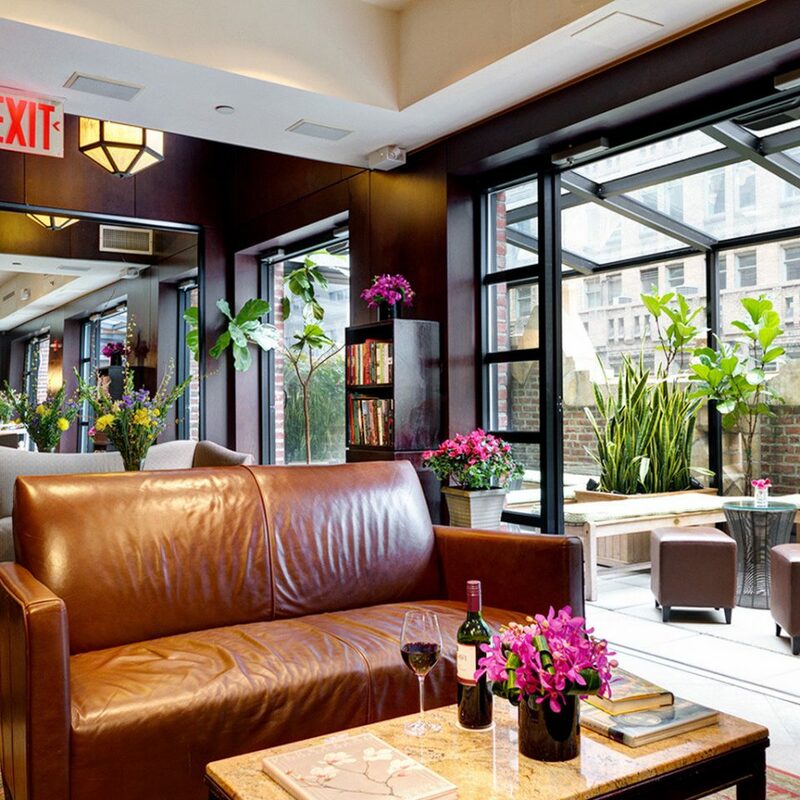 The atmosphere is quiet and contemplative — just the thing after a day in Manhattan’s fast lane. True to its name, the Library has rooms and common areas filled with more than 6,000 books — ranging from art history to oceanography. The theme feels more stylish than kitschy (think clean-lined modern bookcases and a card catalog wall behind the check-in desk). 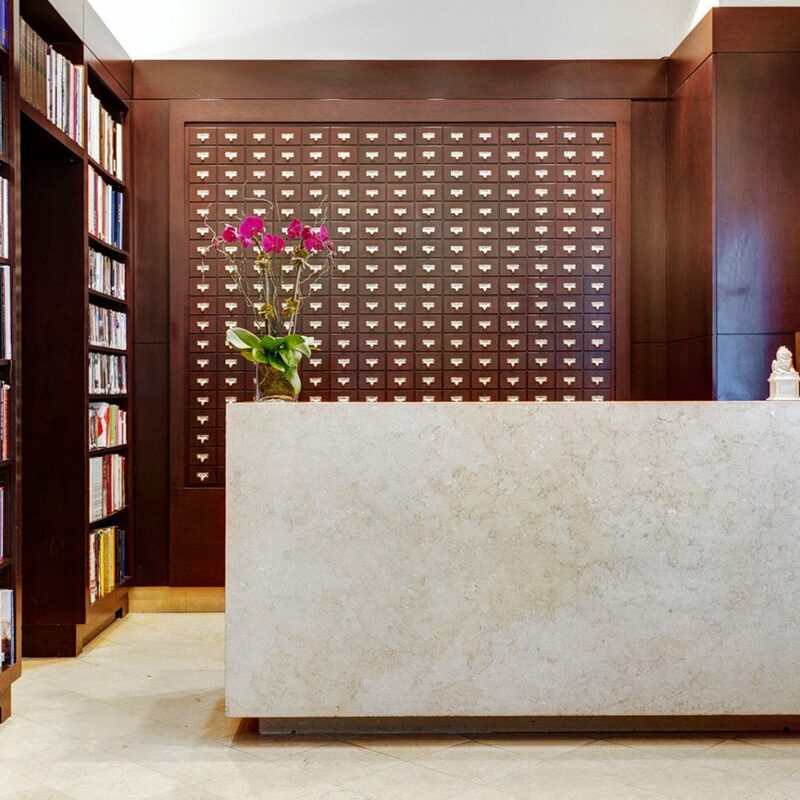 Far from fusty, the Library exhibits a playful spirit in the 60 guestrooms, which are organized according to the Dewey Decimal System. 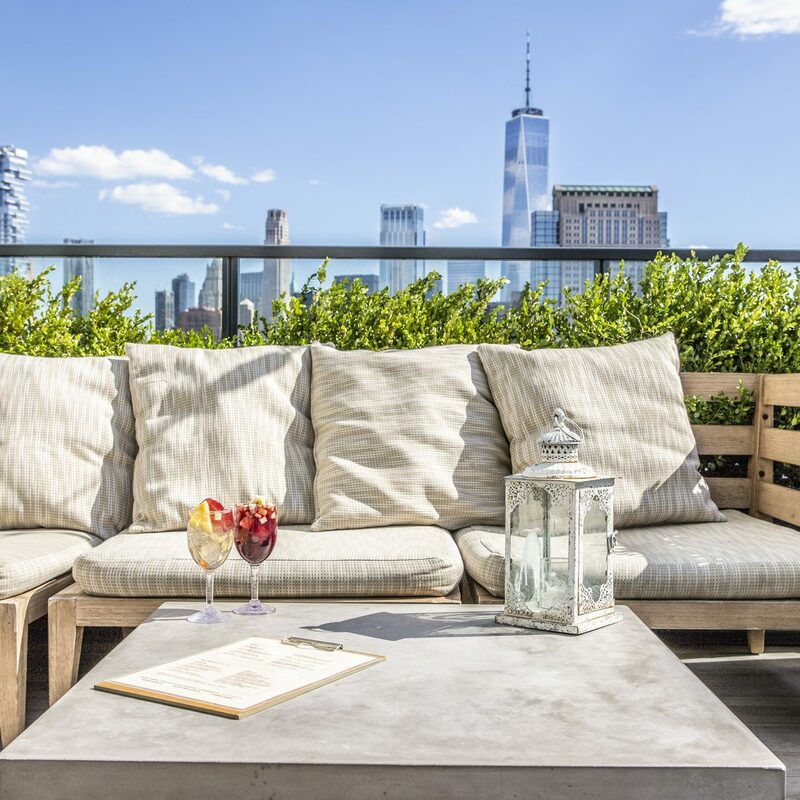 Options include such rooms as Biography, a junior suite with a view of the New York Public Library and a wall-length marbletop cabinet full of — what else? — biographies (of Robert E. Lee and Janis Joplin, to name two). 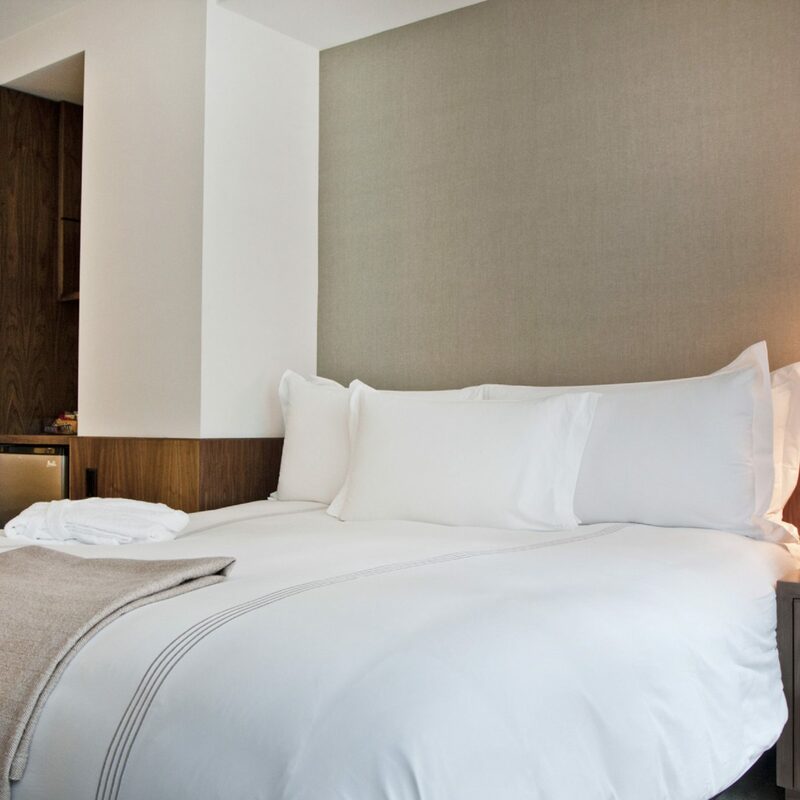 Though standard rooms are small, they feel cozy thanks to dark wood and upholstered leather headboards, soft lighting and fresh flowers. 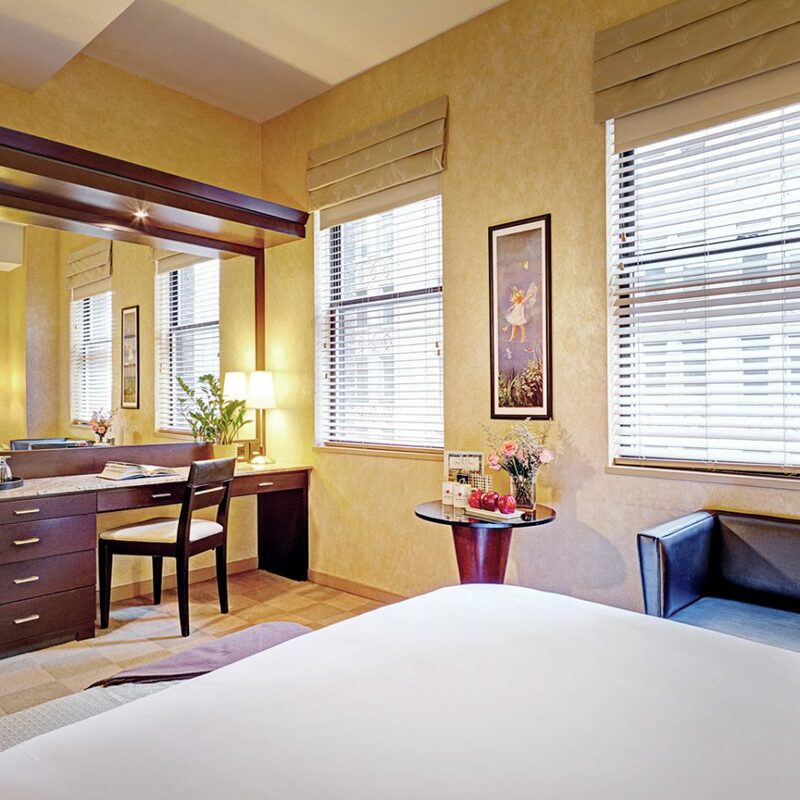 Makeup mirrors, plush robes and Gilchrist & Soames amenities add an indulgent feel to the bathrooms. 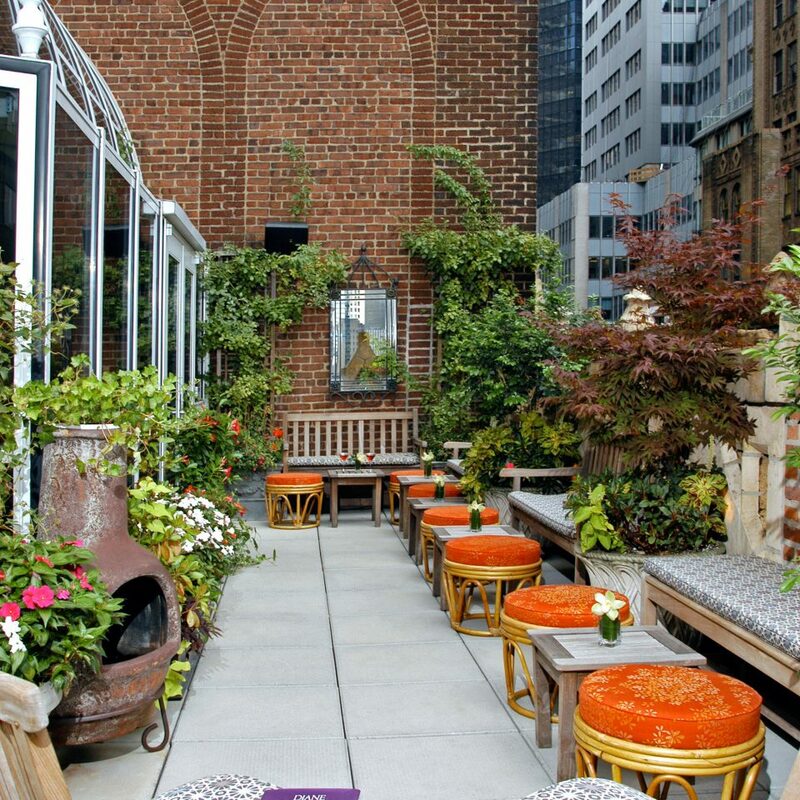 The hotel has a rooftop bar and garden area, which fills up after 5 p.m. with a locals crowd. You can’t go wrong with a kicky Tequila Mockingbird or a more mild Tempest, made with dark rum, passion fruit and ginger beer. There’s also a free wine and cheese reception each evening in the second-floor Reading Room, where guests sip Cabernet and watch the bustle of Madison Avenue. 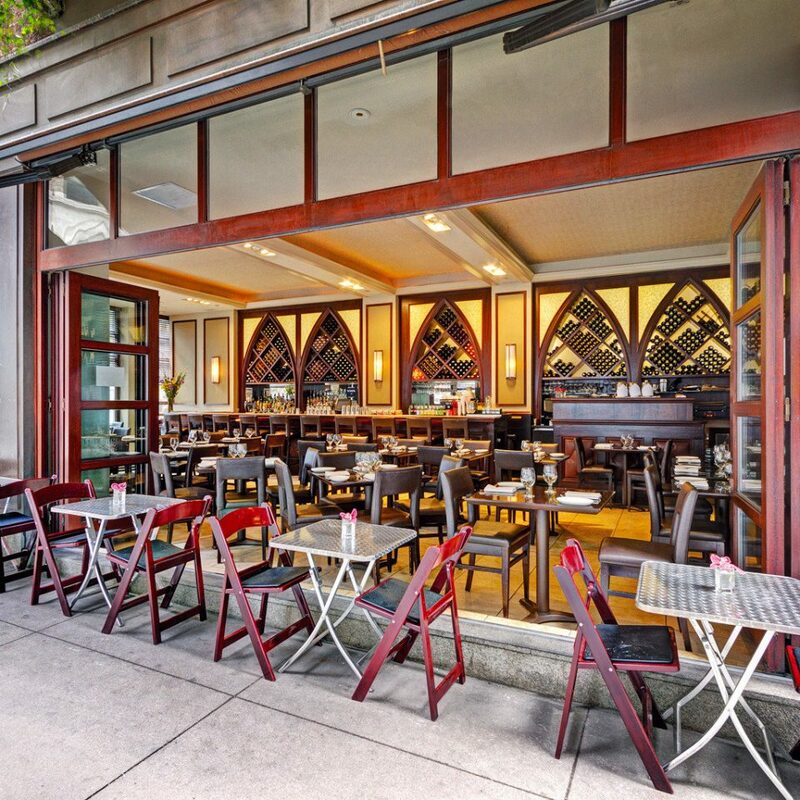 For dinner, head downstairs to Madison & Vine, the hotel’s American bistro and international wine bar. We (family of 4, two adults and two teenager children) visited NYC to see two Broadway shows and spent one night at the Library Hotel. 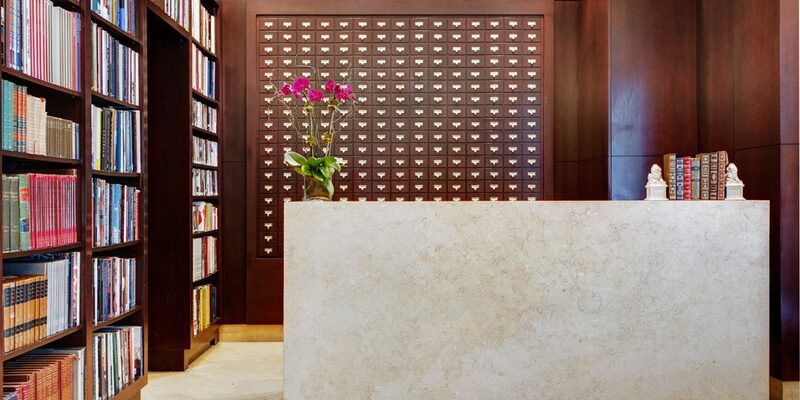 We had always wanted to try the library hotel and we weren't disappointed. 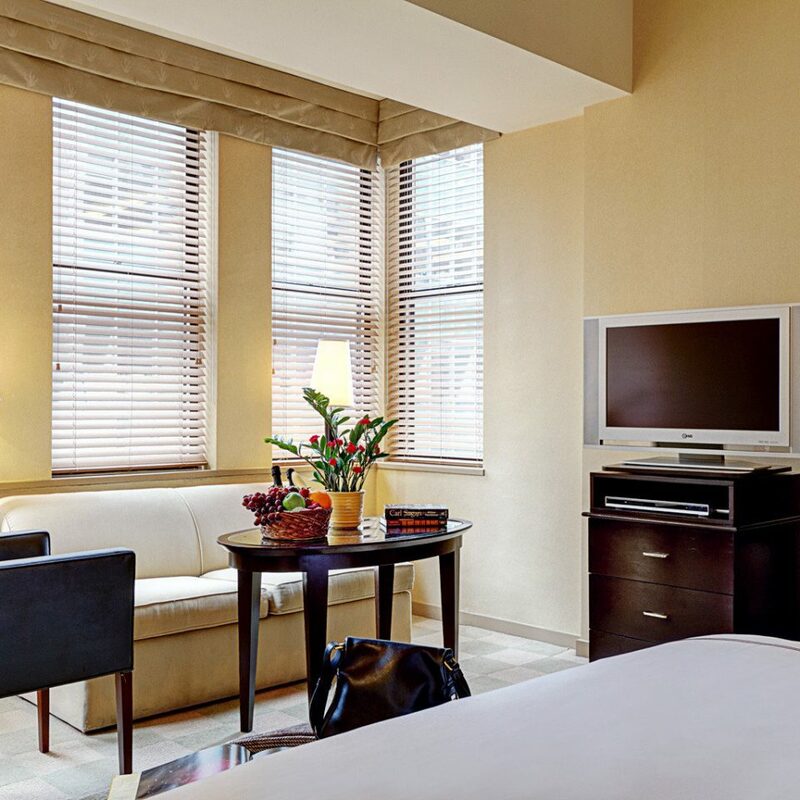 We had a junior suite with a view across from the NY Public Library which was modern, clean and relatively spacious. The staff was excellent. They stored our luggage before check in and after checkout. There is a reading room on the second floor which offers a complimentary continental breakfast, wine/cheese/hor d'oeuvres from 5 to 8 PM, and snacks 24 hours - even after we checked out. Because our room window directly overlooked Madison Ave, there was some traffic noise, but it did not bother us. 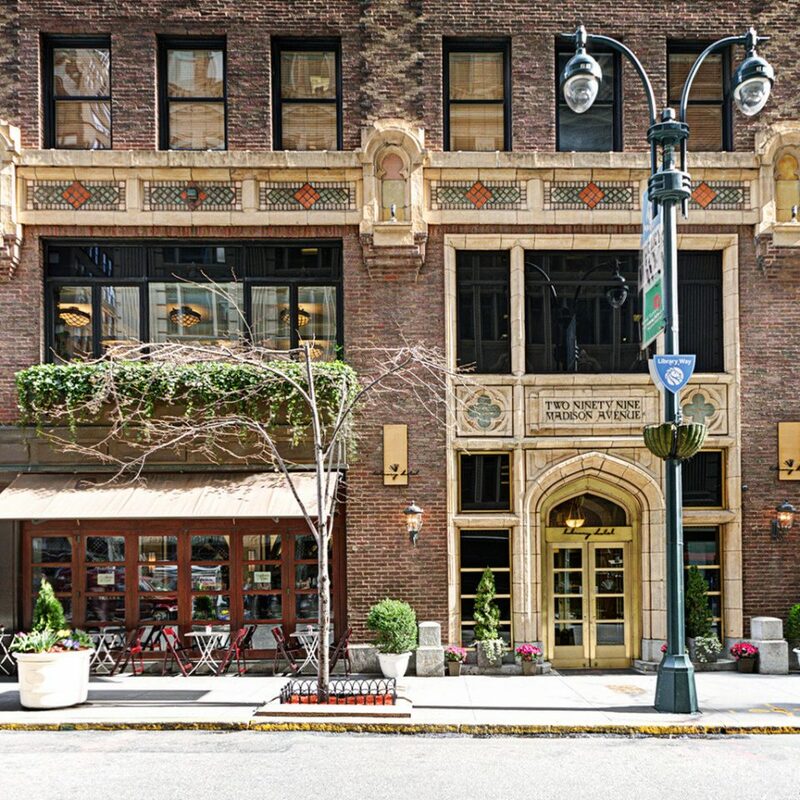 We chose this hotel because it was close to Broadway, it is across from the NY Public Library, and close to the Morgan Librayr. It was about a 10 minute walk to Times Square. There were two excellent restaurants just a few minutes from the hotel (Nirvana Indian and Momosan Japanese.) Would love to stay here again. This is our second stay at the Library Hotel. 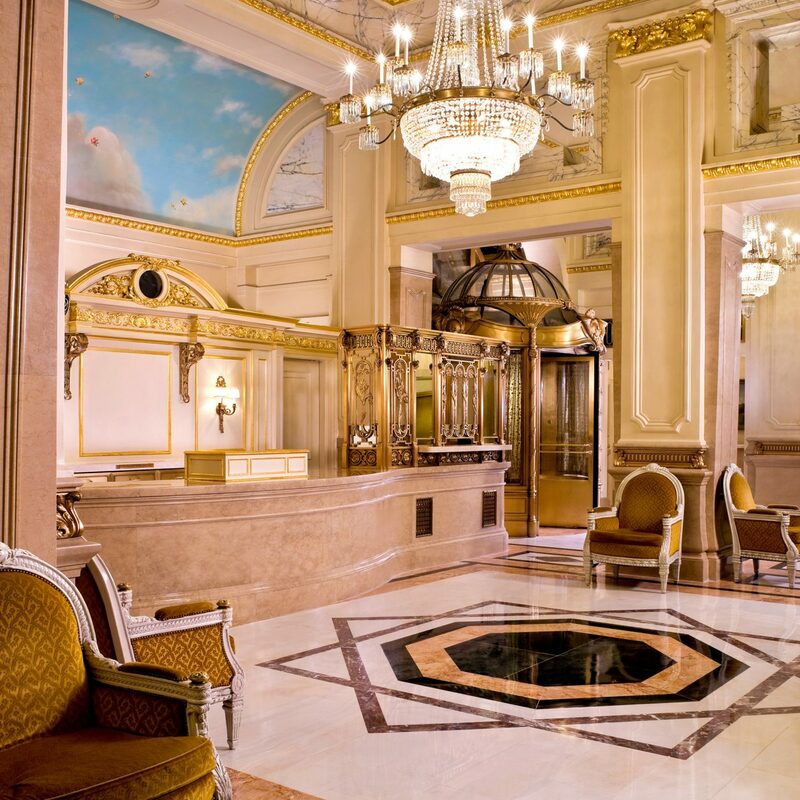 After a busy day in the city, it is an oasis of hospitality and relaxation. The staff is always very friendly, very helpful; in short, superb. The evening wine and cheese, and the morning breakfast, are well-staffed and excellent. Of course the whole idea of being surrounded by all those books is wonderful. The reviews of this hotel did not exaggerate. 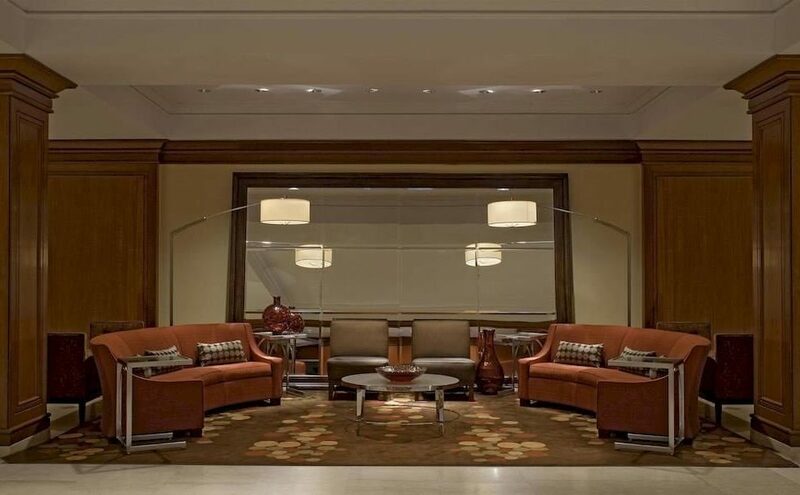 The hotel is conveniently located in mid-town and easily accessible to the subway, the bus lines, and walking paths. The hotel is small, elegant, and immensely comfortable. Our room (deluxe king) was plenty big for the two of us, and the bed was so comfortable! 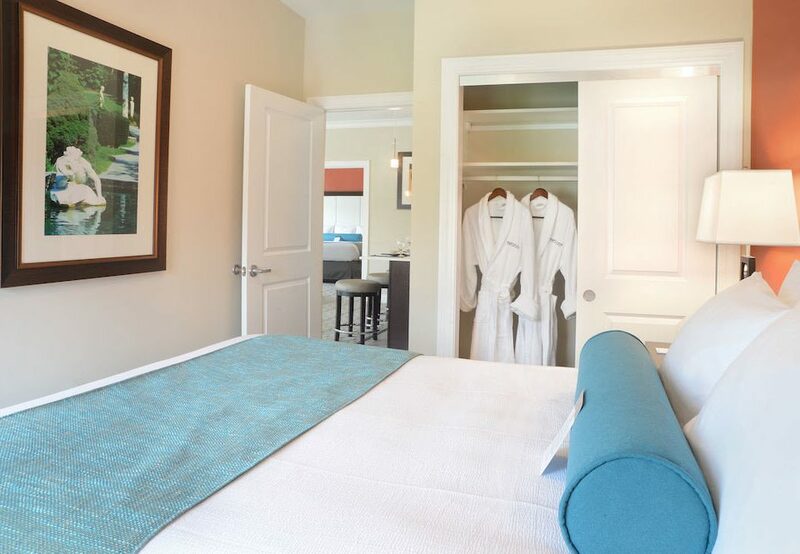 The room and the bathroom were spotlessly clean, and the room smelled fresh and inviting. Having worked in libraries most of my life, I loved the theme. We spent a great deal of time just reading the titles of all the books that lined the shelves in the room and in the lounge. The second-floor 24-hour lounge was one of the highlights of the stay. 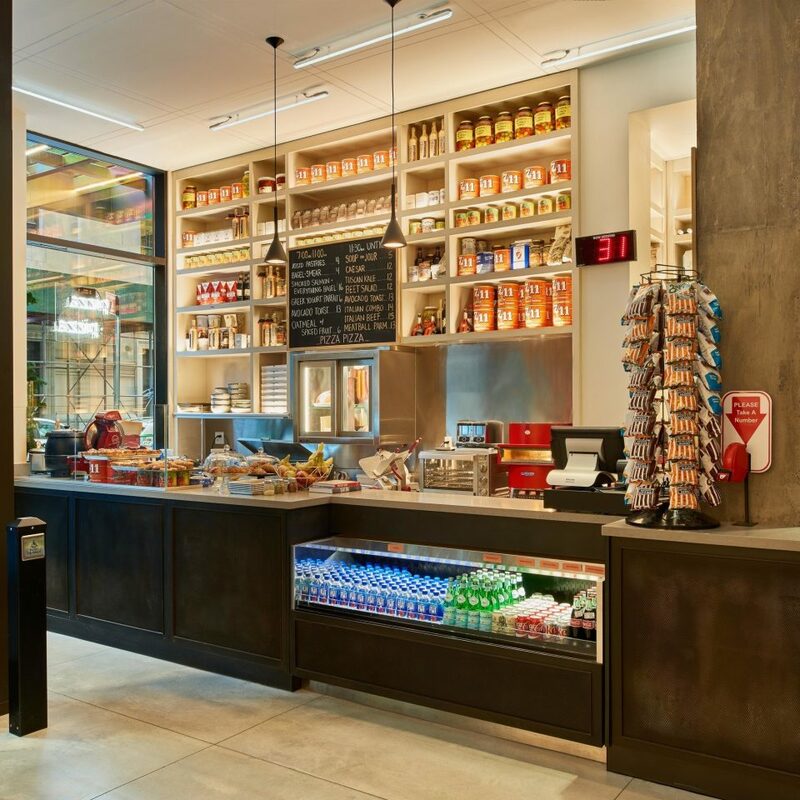 Coffee, tea, snacks, were available at any time and was well-stocked and kept spotlessly clean. I noticed a few visitors dealing with their jet lag in the early morning hours when I visited the lounge. I think that this lounge is one of the best features of the hotel. The top floor garden lounge with the beautiful bar was also a great asset, and a nice place to "get away from it all" during the day, but seriously busy after the bar opens at 4:00 pm. 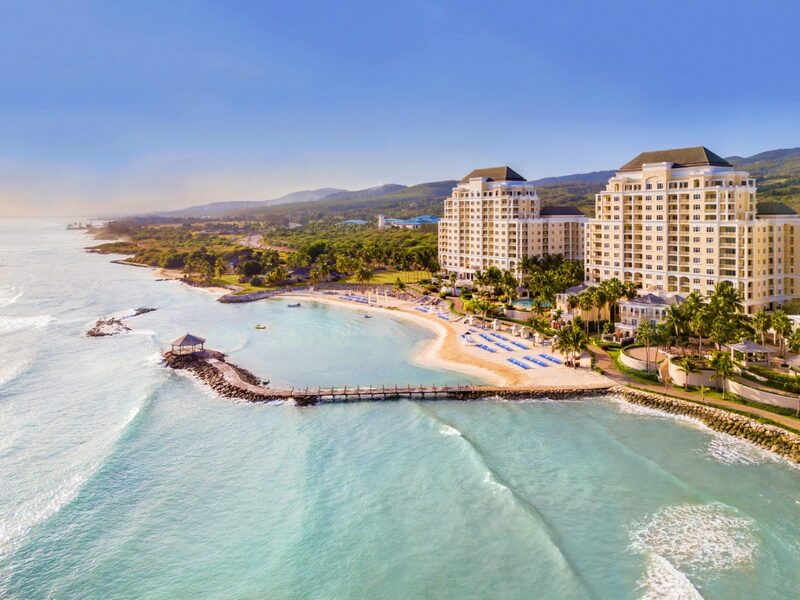 I highly recommend this hotel for couples or singles. Just got back from a great 5 days in New York. I wanted it to be really special, as it was a treat for my sister’s 60th birthday. My brother and sister in law recommended The Library, and I am so glad they did. I could not fault this hotel. It was amazing in every way. The room was spotlessly clean and very comfortable. The Reading Room was ideal for us, especially the complimentary wine and nibbles between 5pm and 8pm! It was great to get a wee prosecco and a nibble before we ventured out at night. So relaxing, especially with the subtle background music. The breakfast was perfect for us – juices, cereals, bagels and bread (which the staff were happy to toast for you), and the fresh fruit cocktail was delicious. You could also pop in to the Reading Room at any time for a tea/coffee and a biscuit or a piece of fruit just to chill out. The staff were also fantastic. The reception staff (so friendly and helpful with any advice we had), all the girls who worked in the Reading Room (were just lovely and so attentive), the staff in the rooftop bar, the guys who worked on the door and the cleaners. The location is ideal. Just round the corner from 2 different subway stations (Bryant Park and Grand Central Terminal). Also if you are travelling from Newark Airport, there is an express bus that drops you just round the corner from the hotel. Can you tell that I liked it? All you need is here. Perfect location, smiling staff, spotless rooms with new bathrooms, great decor with the library theme and very generous hospitality with 24h coffee and snacks and a free light dinner with cheese and wines. Rooftop bar and another Bar at the street level. Price is reasonable. Difinitely would come back.